Santorini is an island in the Aegean Sea and belongs to a group of islands called Cyclades. There is a very fascinating history behind the island of Santorini you see today so keep reading if you want to learn more about it. See Santorini on the map. To study the history of Santorini we must take into account the history of the people that lived here but also the geological history of the island itself. This is a very unique story of an island with an ever evolving shape and many civilizations that tried to adjust to it and left their mark on the island you see today. The island of Santorini was made of lava and has changed shape many times throughout the years. Earthquakes and volcanic eruptions have shaped the island into what it is today. The history of Santorini starts about 5 million years ago, back in a time when Europe and Africa were still connected. At the time, what we know call Aegean Sea, was one piece of land named “Aigiida”. Below you can see a map with the layout of Greece. The brown color on top of it shows "Aigiida", whereas the dark blue marks the lakes and the lighter blue the ocean. As you can tell, it was quite different back then. Eventually this land began to slowly fragment and sink down, leaving only some peaks over the sea level. These peaks are now the islands in the Aegean Sea. On the background is the layout of Santorini today. On the south you can see the rocks that existed before everything else was created. This is what pre-volcanic Santorini looked like. The first volcanic activity in Santorini starts 2.5 million years ago, when the first volcano is created, southwest of the island. This is the place where you find the “Christiana Islands” today (Picture 2). Two more volcanoes later arise near Akrotiri (Picture 2) and a larger one on the North, close to Oia (Picture 3). 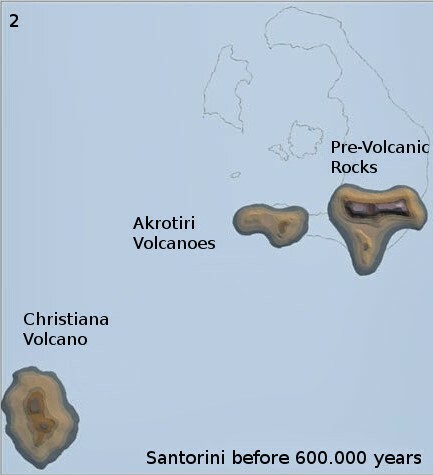 So, about 350.000 year ago Santorini has the shape you see on the right picture below. Interesting fact: The reason volcanoes are created is because when tectonic plates move, magma rises up and volcanoes are basically the exits it uses to reach the surface. These volcanoes were all created along the deep tectonic line that runs from Christiana Islands to Amorgos Island. This fault is still active to this day and is responsible for all earthquakes in the area. So far, we have talked about 4 volcanoes in Santorini. Each one of these would erupt every 20,000 years or so. 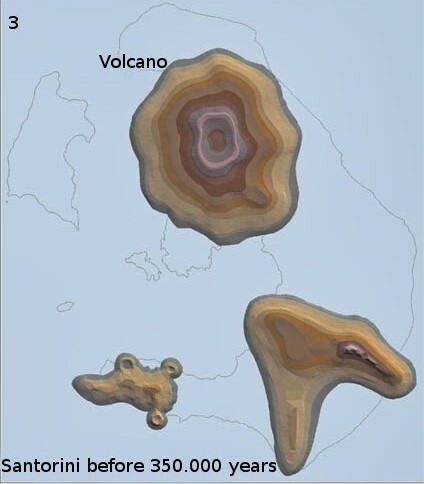 Every eruption would add a new layer of tephra onto the existing island and expand it at the same time. The more catastrophic outcome from these eruptions was the creation of the "Caldera". Caldera is a Spanish word and stands for a big boiling pot. Which is exactly what it is. Imagine magma boiling inside the volcano, and then exploding into the air, leaving the crater empty behind. Magma was supporting all the rocks above the volcano and with it gone, the crater would then collapse into the sea, creating the caldera. 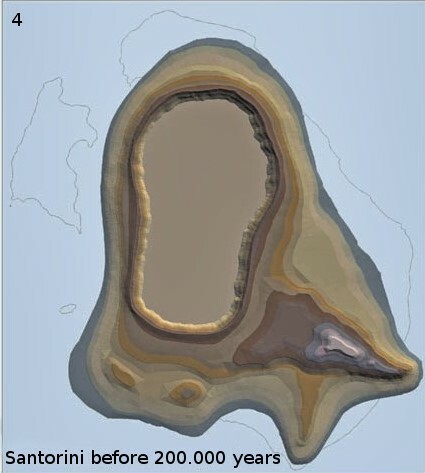 See how the island looked like 200,000 years ago in picture 4 below. Notice the great Caldera in the middle. Santorini 200.000 ago with a big caldera in the middle. 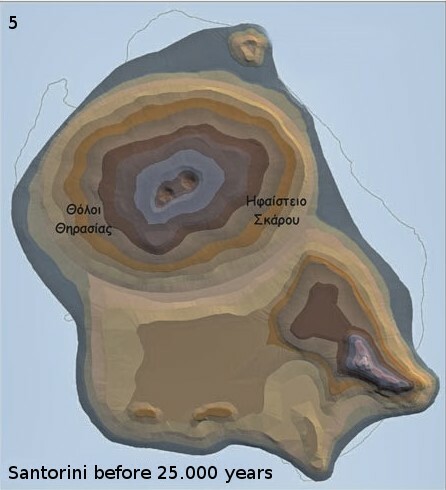 Santorini 25.000 ago: A new, bigger volcano is created. After an extensive series of geological transformations, we know that around 2000 BC Santorini eventually came to have a round shape. It was inhabited at the time and was called “Stroggyli” (which is Greek means round). Santorini 3.700 years ago with a circular shape, known as "Stroggyli"at the time. A few years later, around 1640 BC a great volcanic eruption took place in Santorini, that vanished all life on the island. This is know as the "Minoan Eruption". 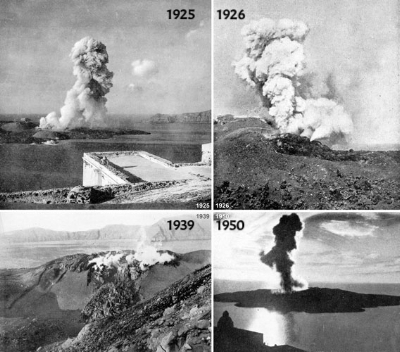 The volcanic activity kept shaping the island throughout time. Between 198 BC and 1950 AD there were 14 more eruptions. It is worth noticing that the two volcanoes that are now in the middle of the island were both formed after the "Caldera" was created. “Palia Kameni” (the larger one) was gradually formed between 19 and 726 AD, whereas “Nea Kameni” (the smaller one) was formed later, in 1573. The last eruption was in 1950 and the volcanoes have been silent ever since. Besides these two volcanoes, there is another one on the northeast side of Santorini, named Koloumpos. This one last erupted in 1650. Don’t go looking for it, as it is underwater! The first inhabitants of Santorini arrived on the island around 3000 BC. It was a very advanced civilization, as these people lived in two and three-story houses, they had storage rooms, drainage systems etc. They produced oil and wheat, they had animals, they were fishermen, painters. All in all, well impressive if you think about it. You can visit the Excavations in Akrotiri to see the remains of this civilization. This city was all buried in lava during the eruption of the volcano in 1640 BC, making Akrotiri the “Pompeii of the Aegean”. Read more about Akrotiri here. Santorini remained uninhabited for a while. The next residents were the Phoenicians that colonized Santorini around 1300 BC. They gave her the name “Kallisti” which means the most beautiful one. Later on, Spartans arrived in Santorini. Their King was named Thiras and thus the island was re-named Thira to honor the king. This remains the official name of Santorini till this day. The legacy of the Spartans can be found in the ruins of Ancient Thira. In 1204 AD Franks arrive to the island and again change the name to Santa Irene, from a local church. This is the origin of today’s “Santorini” we all use. Santa Irene then changes hands again when it becomes part of the Ottoman Empire in 1579. The Turks were impressed with the windmills they found on the island and thus named it “Demergic” which means windmill in Turkish. After Greece independence in 1821, the name “Thira” was re-established, but still the island is mostly known as Santorini. During the Second World War, Santorini was occupied by Italian and German forces (1941 and 1943 respectively). A volcanic eruption in 1950 and an earthquake six years later in 1956 left Santorini in ruins and made more residents leave. They slowly came back and started re-building in the late 60s. The foundation for the new port was laid and in 1972 the airport was also constructed, leading to a small increase in tourism. Santorini is nowadays one of the world's top tourism destinations with 2 million visitors arriving every year to admire its natural beauty. Atlantis was a circular island populated by talented people of high culture and wealth, according to the Greek Philosopher Plato. Some people think it existed, some say it is only fictional. They all agree that it was a small paradise, but they cannot agree on its location. Some say Santorini might be the Lost Atlantis and that is mainly based on its circular shape and the volcanic eruption. Although no one has been able to firmly prove that just yet, I can confirm that Santorini is indeed a small paradise. No matter if it is the Lost Atlantis or not, it is definitely worth seeing it for yourself. I found this very interesting article about the Lost Atlantis. It is perfect if you are looking for more details on the matter. Read it here. If you take a moment to think where you are, I think you will be astonished. Santorini has changed so much throughout the years. It keeps changing. The volcanic activity defines its shape. And its future. People merely adjust to it. Looking at the caldera, you know this was land. And it all went under. Think about all these people that were here before you. So long ago. Think about all the things they accomplished at the time and how far we have come. Lava made this island. But lava also destroyed it. It is a wild beauty that is just hard to find. One of a kind. This natural beauty we admire is more powerful than any civilization. Nature is more powerful than any human. Respect it. Disclaimer: I am not an historian myself, I just read and learn as I go along so forgive me for any mistakes. It took a lot of studying to put this together and I learnt a lot myself! "Blue Volcanoes" Santorini, 2005, George E. Vougioukakis. Published by Thira Municipal Corporation For The Development Of Culture and Tourism. Pictures 1-6 representing the shape of Santorini are from the book "Blue Volcanoes"mentioned above. This is really the best book I have read about Santorini so far. Concise and comprehensive.